YouTube is one of the largest search engines in the world. And writing descriptions with keywords can help viewers find your videos more easily through search. Descriptions can convey valuable information that helps viewers find your videos in search results and understand what they’ll be watching. Well-written descriptions with the right keywords can boost views and watch time because they help your video show up in search results. Give an overview of your video using natural language -- not just a stream of keywords. Put the most important keywords toward the beginning of your description. Identify 1-2 main words that describe your video and feature them prominently in both your description and title. Use Google Trends and Google Ads Keyword Planner to identify popular keywords and their synonyms. Including these terms can help you maximize traffic from search. Avoid irrelevant words in your description because it creates a poor viewing experience and may violate our policies. Note: The strategies in this lesson are suggestions pulled from our experience with YouTube creators and are not promises or guarantees for success. The phrase “morning yoga” (underlined in red) appears in this video’s title and description, which increases the likelihood that YouTube could surface the video in search results. Searching for the keywords “morning yoga” returns this same video in the #1 slot of YouTube search results. The description field is incredibly useful for helping viewers find, learn about, and decide if they’d like to watch your videos. You can think about the description as two parts -- what viewers see before they click “Show more” and what they see after. Consider prioritizing the first few lines of your description to describe your video because it’s what viewers will see first. You can add other key information about your channel, metadata, and even links to social networks or your website below that so that viewers can learn more. You can even create a default description that autopopulates key channel information in all of your videos upon upload. Be sure each video has a unique description; this makes it easier to find through search, and helps it stand out from similar videos. Use the first few lines of text to explain what the video’s about using search-friendly keywords and natural language. Use the rest of the text (what shows up once they click “Show more”) for extra information like what your channel’s about, social links, etc. Fill out the default description text field to display extra information across all of your videos automatically. The area outlined in blue above “Show more” can be seen in search results, on the watch page, and when your video appears on user’s feeds. It’s good to include keywords here that describe what your video is about. Viewers must click “Show more” to see the rest of the description (outlined in green) below. The full content of your description only appears when “Show more” is clicked. In the example above you can see that Blogilates writes a unique description for every video, then uses the default description (which appears below the first three lines) to consistently display the same information across all videos. The description field can only display text, but it doesn’t have to be a boring experience. You can add interactive features that could help increase views, highlight collaborations, and grow your subscriber base. Use time stamps to help viewers skip to important parts of longer videos. Link to playlists of related videos. Don’t forget to put the http:// prefix in front of all web addresses to make them clickable. You can use the description to acknowledge co-stars and other people who helped you out with your video. Linking to time stamps in the description can help you guide viewers to the most important moments of your video. Find out how your description looks on different pages and devices, along with how it performs in YouTube Analytics, to learn if it’s attracting viewers. Preview the description in YouTube search, on the video’s watch page, and on various mobile devices to make sure the most important information is visible. Help your video show up in YouTube search. Analytics can tell you what keywords lead people to your video. If any major or important themes of your video don't appear in your search report, it may be because you never added those words in your description. Pretend you're searching for your video: what would you type into the search bar? Those words should be in the description. Which keywords help viewers find your videos? Check YouTube Analytics Traffic Sources to see which keywords people use to find your videos. Are any important keywords missing from your videos? A good practice is to check how your description appears in important places like YouTube search, watch page, mobile devices, etc., to make sure the most important information displays as intended. 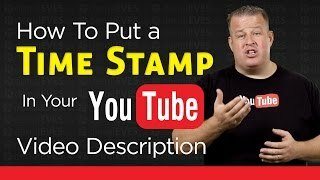 Every time you upload a new video to your channel, you’ll be prompted to write a description.The more you make your video stand out using tools like the description field, the better chance it has of succeeding on YouTube. It’s also easy to update video descriptions should you decide to add or remove information later on. Fill in a description when uploading new videos. 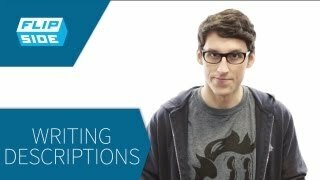 Writing unique and specific descriptions for each video may generate better results. Set a default description with extra information (like a channel description) that will be automatically added to the description of each video. This video describes some important things to think about for writing good descriptions that aid in discovery and help get people to watch your videos. You can use related hashtags (#) in video descriptions to help viewers find your video when they search for a specific hashtag. When you upload a video, you can enter hashtags (#hashtag #example) in your video’s title or description. Hashtags in the video description are links that users can click on to go to that hashtag's search results page to see more videos on that subject. Add hashtags in key parts of your description to help viewers find your video. Ensure that you only use hashtags related to your video. For example, if you upload a review of a specific movie do not add hashtags related to different or unrelated popular movies, actors or unrelated topics to falsely increase views. A little goes a long way -- try not saturate your description section with hashtags. YouTube will ignore all hashtags on a video if it has more than 15 hashtags. Hashtags are especially great to use with trending content, such as upcoming events or people in the news. This ensures that viewers looking for videos about the trending topic will find a variety of relevant content. These strategies are suggestions pulled from our experience with YouTube creators and are not promises or guarantees for success. Adding ordinary tags or repetitive metadata may result in your video violating our Community Guidelines. Learn more.